Published in Facial Plast Surg Clin North Am. 2009 Nov;17(4):549-56, vii. by Karam AM, Nayak LM, Lam SM. Despite the variety of novel and sophisticated facial rejuvenation technologies available today, management of the lower face and neck remains primarily surgical in nature. The reference standard treatment for correction of the senescent jaw line and neck is a rhytidectomy. from the original skin-only rhytidectomy approaches of the early 1900s, through the more complex sub- subcutaneous muscle–aponeurotic system (SMAS) techniques used from the late 1970s through most of the 1990s.1–6 The paradigm began to shift slowly as surgeons began to realize that bigger operations do not necessarily result in better results. In fact, in face of the higher complication rates and morbidity, several surgeons began to question the utility and rationale for the conventional facelift techniques involving deepplane or sub-SMAS dissections. In the late 1990s, Daniel Baker and Zia Saylan popularized the lateral SMASectomy and the S-lift, respectively.7,8 Both these techniques incorporate a short incision approach coupled with a supra-SMAS dissection plane and a largely vertically oriented vector of SMAS elevation. These novel techniques illustrated the potential for excellent, naturally enhancing results, decreased potential morbidity, and surgical expediency. Saylan’s S-lift was the first purse-string facelift and involved an SMAS plication technique that was intended to provide an even less invasive facelift procedure. It featured a short, preauricular-only incision, short flap, and double purse-string sutures that were anchored to the periosteum of the posterolateral zygomatic arch. The procedure was intended to be performed under local anesthesia, a consideration that was appealing to many patients. Although the technique was considerably more conservative, it delivered efficacious results for both men and women between the ages of 40 and 50 years. The most obvious shortcoming was the inability to improve significantly the cervicomental angle and overall neck laxity. Tonnard and Verpaele’s minimal access cranial suspension (MACS) lift, described in 2001, was a significant advance in purse-sting facelift technique. By performing additional undermining onto the lateral face and jowl region, adding judicious submental liposuction, and using larger pursesting sutures to capture the cranial border of the platysma more effectively, overall results were improved, especially in heavier faces and those with more cervicomental laxity than the S-lift could correct. Fig.1. 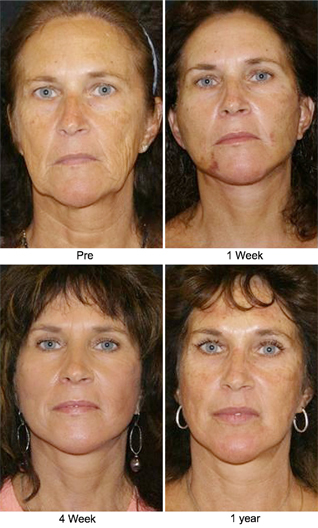 A series of photographs taken before and after a short-scar purse-string facelift and limited submento- plasty. Note the limited edema and minimal ecchymosis 1 week postoperatively. Despite the significant degree of photodamage and loss of skin elasticity, the results remain durable over the 1-year period. (Photographs cour- tesy of L. Mike Nayak, MD, St Louis, MO. In June 2004, Brandy introduced a modification of Saylan’s S-lift.9,10 Since then, the operation has continued to be refined. 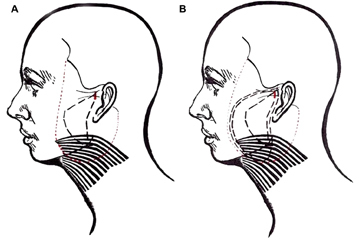 Compared with the original S-lift, Brandy’s modified purse-string facelift involves postauricular undermining and undermining of a larger region in the lateral neck, more aggressively correcting the platysma-SMAS complex. The lift is more vertically oriented than the S-lift, further correcting the cervical laxity. The ability to correct greater degrees of neck and jowl laxity broadens the indications to include individuals of all ages. The authors’ work is based largely on this modification, and they owe credit to Brandy for the advances he has made in the purse-string facelift. The purse strings themselves also are different from those used in the S-lift or MACS lift; in this case, they are concentric, with a smaller, central purse string pretightening the face and drawing even more of the cranial edge of the platysma into the field to be captured definitively by the larger, eccentric, second purse-string suture. This double encircling purse-string suture allows progressive, incremental tightening and also creates a favorable fullness at the region of the gonial angle, which often is deficient in aging faces. surgical risks, and convalescence associated with these more extensive approaches may not be warranted in the average facelift patient. Later, Prado and colleagues12 published a split-face study comparing the lateral SMASectomy with the MACS lift (purse-string facelift). In this study, there was no detectable difference in result durability at 2 years between the SMASectomy and the purse string facelift side. The overall conclusion of these studies is that, as long as the SMAS and platysma are fundamentally repositioned and stabilized, the results will be meaningful and enduring. As an extension of this concept, the choice of technique should be based on achieving the best results with the least risk, morbidity, and convalescence. Fig. 2. Photographs taken before and 1 year after a short-scar purse-string facelift and limited submentoplasty. Fig. 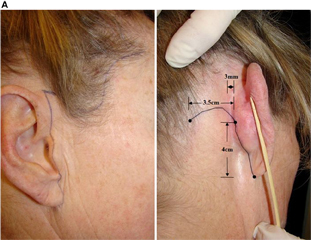 4A illustrates the typical incision marking used, beginning with a short, intensively beveled preauricular trichophytic incision that continues into a preauricular, post-tragal incision. This incision then continues for a variable degree into a postauricular incision. In patients who have mild laxity or excellent skin tone, the incision may terminate at the base of the conchal bowl. In very lax, photodamaged skin, the incision probably will need to be carried up to the helix-hair touch-point and then back down the hairline as a beveled, trichophytic occipital hair-edge incision. 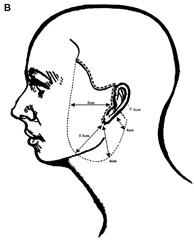 Average undermining distances then are drawn 5 cm anterior to the tragus incision line, 5.5 cm anterior to the earlobe along the angle of the mandible, and 6 cm inferior to the earlobe. In general, the less elastic the skin, the more prone it is to postoperative ‘‘sweeping’’ from a strictly vertical lift, and the more aggressive the skin undermining must be to prevent this outcome (Fig. 4B). When the procedure is performed under local anesthesia, diazepam (10 mg) is administered orally, and a combination of midazolam (2.5 mg) and meperidine hydrochloride (50 mg) is given intramuscularly before the initiation of the procedure. The patient then is brought into the operating room, and the face is prepped with povidoneiodine solution. The area to be undermined is infiltrated with 0.25% lidocaine hydrochloride with 1:400,000 epinephrine using a 21-gauge spinal needle and making certain to remain in the subcutaneous space. At this point, in patients who have superficial submental fat, a standard submental liposuction is preformed. In patients who have a moderate degree of submental platysmal banding, a medial platysmaplasty is preformed to the level of the hyoid after the elevation of a submental skin flap. Back cuts are made in the platysma to enhance the cervicomental angle. Next, an incision is initiated at the temporal hairline. Subcutaneous undermining is begun with a Bard-Parker No.15 blade and then is completed using the facelift scissors. The most critical aspect of the skin undermining is to make certain that the flap is not excessively thin at the predicted site where the V-shaped advanced flap opposes the scalp (at the superior attachment of the pinna). This region is most susceptible to necrosis and should be as thick as possible, without capturing the superficial temporoparietal fascia. When all the undermining is completed, thorough hemostasis is accomplished. At this point in the procedure, the encircling double purse-string SMAS plication is performed. First, 0.25% lidocaine hydrochloride with 1:400,000 epinephrine is injected into the site of the anchor sutures. These injections are performed with a 1-inch 30-gauge needle and are extended all the way down to the zygomatic arch 1.5 cm away from the skin edge of the tragus, a course that should be safely behind the expected course of the frontal branch of the facial nerve. The choice of suture depends on the surgeon’s performance and ranges from 2–0 green braided nylon (EthiBond, Ethicon Inc, Somerville, NJ) to 0 or 1 purple polydioxanone. The anchoring suture is placed 1.5 cm away from the skin edge, directly over the posterior zygomatic arch (Fig. 5). The suture needle should scrape bone and should grasp the periosteum before surfacing. The posterosuperior position of the first purse string is the anchor stitch. The diameter of this purse string is about 4 to 5 cm, and it extends down to the cranial portion of the platysma (just below the angle of the mandible). Each bite is roughly 1.5 cm long and should be deep enough to engage the fibrous SMAS (not just subcutaneous fat) but not so deep as to jeopardize the facial nerve. The second anchoring stitch is performed eccentric to the first. The needle enters 3 mm above and 3 mm medial to the knot of the first purse string. This anchor suture is placed in the periosteum of the zygomatic arch similar to the first suture. Four to five 1.5-cm-long grasps through the SMAS are taken in a directly inferior direction (Fig. 6B), taking care to continue well beyond the angle of the mandible before turning anteriorly to ensure the capture of several solid bites of the cranial border of the platysma in the submandibular region. The remainder of the 1.5-cm-long grasps follows the outer edge of the undermined zone toward the periorbital region (Fig. 6B). The first four grasps along the line of undermining tighten platysma; the remaining grasps tighten the SMAS. Note the overlapping of the grasps in the lower neck and midface areas (Fig. 6A and B). These overlaps prevent ripthrough in an area where the tissues sometimes can be frail. Fig.5. Intraoperative view. The newer encircling double purse-string plication technique involves first performing an anchor suture 1.5 cm away from the skin edge. This anchor suture is directly over the zygomatic arch, passes all the way to the bone, and is 1.5 cm in length (A, B). When the second purse string arrives at the height as its origin anchor suture, 1.5-cm grasps of SMAS are made toward this higher anchor suture (3 mm above the first anchor suture). The last grasp, before meeting the second anchor suture, should be a third anchor suture creating a V-shaped double anchoring point for the larger second purse-string suture. This third anchor suture is not as deep as the first two but should at least be 3 mm deep. Once again, five throws of the suture are made, and a 2-mm suture end is left. As soon as the encircling double purse string is completed, thorough hemostasis is accomplished, and the redundant skin is excised. The skin drape vector can vary from patient to patient. Although the vector usually has a predominantly vertical direction, in patients who have extensive photoaging, a more posterior skin drape may be required to prevent upward striae in the healing skin flap. The flap is inset using a combination of deep 5–0 polydioxanone sutures. The deep sutures from the temporal hairline to the superior attachment of the ear are tacked down to the temporalis fascia. These tacking sutures are critical for stabilization and anchoring of the flap. Once these sutures are completed, the 5–0 polydioxanone sutures are placed throughout the length of the remaining incision. After all deep sutures are placed, the skin is sutured with a running 6–0 fast-absorbing gut suture. Patients are asked to wash the incisions three times per day with a mild soap. Antibiotic ointment is applied to all incisions for 4 to 5 days. Antibiotics typically are prescribed. A cold compress is placed under the chin strap for the first 2 to 3 days. At 1 week, the patient can apply waterbased makeup to all incision sites. Patients are seen 1 week, 6 weeks, 3 months, and 1 year postoperatively. Complications were found to be rare with this approach. The authors experienced a 1% incidence of flap skin necrosis (>1 cm2) at the level of the superior helix. Conservative wound care was used with spontaneous resolution. Hematomas requiring evacuation occurred at a rate of 1% and were managed by simple aspiration in the office on postoperative day 1 without the need for re-exploration. Hypertrophic scarring of the postauricular incision occurred in 1% of the cases and was managed with steroid injection without complication or need for scar revision. There were no cases of permanent or temporary facial nerve weakness. All patients had temporary anesthesia over the undermined area that resolved in approximately 3 months. 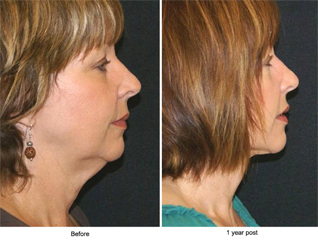 A variety of surgical approaches exist for rejuvenating the lower face and neck. When comparing these approaches, it is tempting to focus primarily on the potential results each of these procedures can achieve. It is equally, if not more important, however, to remember that these procedures are elective and cosmetic, and it is essential to balance the risk–benefit ratio when comparing operative techniques. Patients today are less accepting of long downtimes and relatively highrisk exposure; they want meaningful results achieved in the safest way possible. In the authors’ experience, many patients prefer improvement over perceived perfection, if the former involves less downtime, less risk, and a lower potential of an unnatural or overoperated appearance. 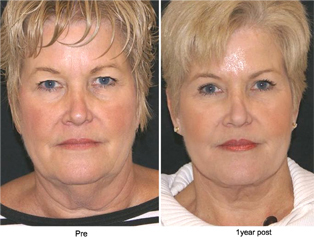 Because of its vertical advancement, the vertical purse-string facelift combines the simplicity and safety of a superficial rhytidectomy while providing substantial rejuvenating outcomes to the lower face, neck, and midface. Similar to Tonnard’s MACS-Lift and Baker’s lateral SMASectomy, the vertical vector used in this procedure produces significant rejuvenative results. Use of the deep fascia overlying the lateral periosteum as an anchor point provides a stable fixation point for the double purse-string plication sutures. Patient recovery ranges from 1 to 2 weeks. The potential for serious long-term complication (ie, motor nerve damage or distorted facial soft tissue contour) is limited. To date, consistency and patient satisfaction have been extremely high. 1. Lexer E. Zur Gesichtplastik [comment]. Arch Klin Chir 1910;92:749. 2. Joseph J. Plastic operation on the protruding cheek [comment]. Dtch Med Wochenschr 1921;47:287. 3. Ramirez OM, Pozner JM. Subperiosteal minimally invasive laser endoscopic rhytidectomy: the SMILE facelift. Aesthetic Plast Surg 1996;20(6):463–70. 4. Toledo LS. Video-endoscopic facelift. Aesth Plast Surg 1994;18(2):149–52. 5. Hamra ST. Composite rhytidectomy. Plast Reconstr Surg 1992;90:1–13. 6. Ullmann Y, Levy Y. Superextended facelift: our experience with 3,580 patients. Ann Plast Surg 2004; 52(1):8–14. 7. Baker DC. Lateral SMASectomy. Plast Reconstr Surg 1997;100:509–13. 8. Saylan Z. The S-lift for facial rejuvenation. Int J Cosm Surg 1999;7(1):18–23. 9. Brandy DA. The QuickLift: a modification of the s-lift. Cosmet Dermatol 2004;17:251–360. 10. Brandy DA. The Quicklift: featuring an encircling double purse-string plication technique with blunt neck/jowl undermining for tightening of the sagging SMAS, platysma and skin. Am J Cosmet Surg 2005; 22(4):223–32. 11. Ivy EJ, Lorenc ZP, Aston SJ. Is there a difference? A prospective study comparing lateral and standard SMAS face lifts with extended SMAS and composite rhytidectomies. Plast Reconstr Surg 1996;98(7): 1135–43 [discussion: 1144–7]. 12. Prado A, Andrades P, Danilla S, et al. A clinical retrospective study comparing two short-scar face lifts: minimal access cranial suspension versus lateral SMASectomy. Plast Reconstr Surg 2006;117(5): 1413–25 [discussion: 1426–7].